Your Roof is the Crown and Glory of Your Home. Exposed to the elements…sun, heat, cold, wind, rain, snow…and is subject to deterioration from stress, impact, humidity, mildew, algae, and improper installation. Exposed to the public eye your roof also has the potential to make your home more appealing, more valuable…or the eye sore of the neighborhood. 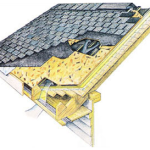 This illustration depicts a typical roof section and all the parts and pieces that go into making it a complete residential roofing system. The arrows are indicating the flow of air that needs to circulate from under the eaves to peak or installed vents. This circulation of air prevents humidity build up and condensation that can ruin the effectiveness of the insulation in your attic and generate enough moisture to “rot” out the woodwork around your gables and fascia. 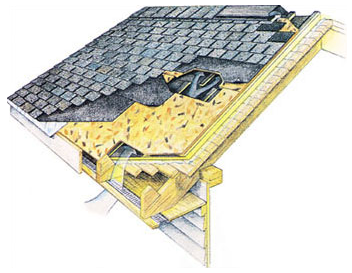 Reduced air circulation, caused by improper venting, can also decrease the life of your shingles. Along with the additional weight of winter snow and the effects of heavy rain and the blistering temperatures generated by the summer sun, wind, and hail storms can damage or destroy your roof completely. 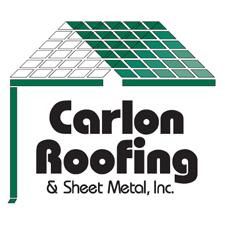 Carlon Roofing & Sheet Metal® offers complete residential roofing repair services. We have established relationships with the major Insurance Carriers, and have extensive experience working with adjusters to make sure your roof is repaired or replaced in a timely and professional manner in the event your home is hit. Get a residential roofing estimate today!